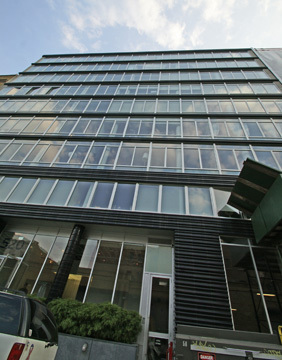 The handsome, 11-story residential condominium building with 26 apartments at 520 West 19th Street was erected in 2008 by Bishopscourt Realty, of which Keith and John Jacobson are principals. 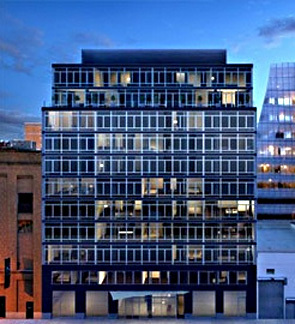 SLCE Architects and Selldorf Architects, which worked on the interiors of the Urban Glass House condominium building at 330 Spring Street, and the interiors of the Abercrombie & Fitch store on Fifth Avenue at 56th Street and the "en-suite garage tower" at 200 Eleventh Avenue, designed the building, which is distinguished by is use of "midnight blue" terracotta and a curved entrance marquee. The lobby, which is attended 24 hours a day, has terracotta-clad columns, Venetian plaster walls with granite and marble details and silver-gray terrazzo. The mid-block building, which in the initial renderings, conjures a man's blue pin-stripe suit, is between 10th and 11th Avenues and is down the street from the spectacular, new Frank O. Gehry-designed office building on 11th Avenue now nearing completion. It is also next to the Metal Shutter Houses designed by Shigeru Ban and it is across the street from Jean Nouvel's curved tower at 100 Eleventh Avenue. This block, therefore, is Chelsea's chic answer to Bond Street in NoHo. This building has 8 two-bedroom apartments with 1,460 to 1,582 square feet, 16 three-bedroom apartments with 1,980 to 2,090 square feet, some with terraces, and 2 five-bedroom duplex penthouses with interiors and 4,054 and 4,232 square feet and terraces of about 640 square feet. The top two floors are setback. Apartments will have floor-to-ceiling windows. Kitchens will have Arclinea cabinetry, Marmo Grablo marble countertops, Sub-Zero refrigerator and wine cooler, Miele dishwasher and Axxis/Nexxt washers and dryers by Bosch. Bathrooms will have marble or travertine vanities, tub walls and decks, bathtubs and sinks by Kohler, toilets by Duravit, sink and tub fixtures by Grohe. There are storage units in the basement. 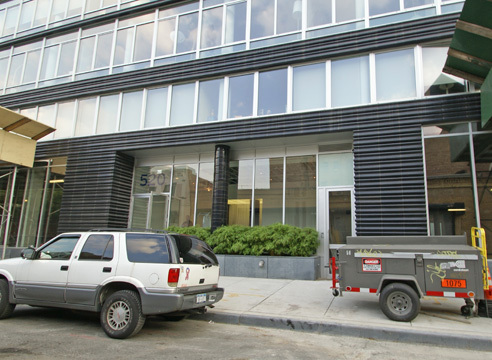 The building has sidewalk landscaping. The black, ribbed facade at the base is alluring and reminiscent of Art Deco bakelite kitchen ware and it is a shame there is not more of it higher up. The founded column in the cener of the base looks like a handle for two glass oven doors. These are impressive and very nice design touches, but it's a shame there are not more.